Did you know that we have another native Texas hibiscus? I sure didn’t until I was at the Lady Bird Johnson Wildflower Center’s sale last fall and nabbed this Hibiscus martianus. It was tiny and possibly not cold-hardy, so I protected it over winter under our patio “greenhouse.” I potted it up in April and it’s been blooming ever since. It may be hardy to the high 20s, but I’m keeping it in a pot. Native Turk’s caps robustly frame Sam Jr.’s late afternoon perch. Butterflies are all over them, and hummingbirds will be, too, when they show up! Usually they’re here by now, but guess they’re hanging out in your gardens! In our little back “prairie” which replaced grass long ago, it’s always a wildlife field day with lantana, Rock rose, Turk’s cap, butterfly weed (Asclepias), goldenrod, passion vine and more. I’ve added some taller shrubs and clumping grasses to give the madness a little structure. They’re still getting their roots in, but I see a beautiful future ahead! That’s part of gardening: looking ahead. This week we taped a garden where the woman has been planning her native understory trees while her shade trees grew up. Now, the seedlings she started are ready to take their understory place. In some spots, oxalis is still hanging on, attracting bees. Alongside, native Rock rose (Pavonia lasiopetala) is beloved by butterflies and hummingbirds. In the den bed, it’s all about orange right now with ‘Patrick’ abutilon and ‘Tawny’ daylilies. ‘Patrick’ is just gearing up, but the daylilies are about out of steam. Cedric and Sam Jr. complete the orange theme on a steamy morning that fogged up the lens. Back to the prairie: One anchor is our bird bath with solar fountain. After the wildlife dines, they stop in for a drink and a bath. 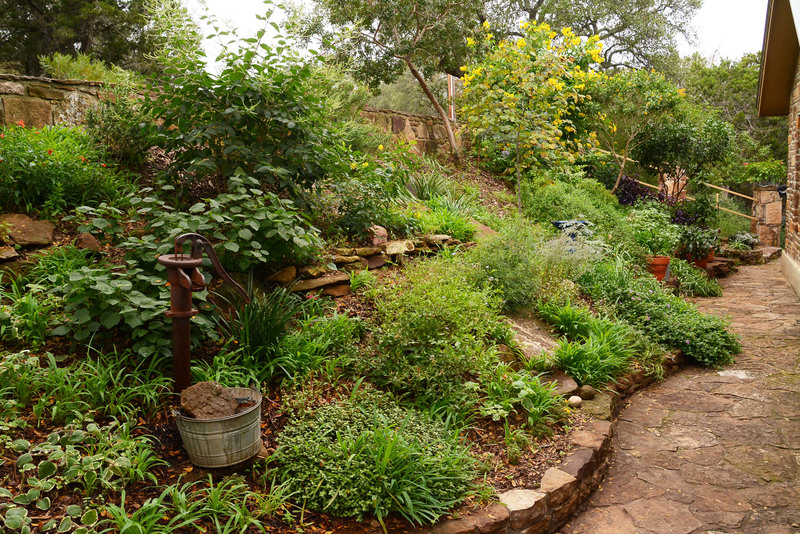 Since the sound or scent of water heads wildlife straight to your garden, this week Tom meets with Bj Jenkins and Karl Tinsley from the Austin Pond Society to preview this year’s remarkable tour. On June 9 & 10, they’ve got something for every budget, space, and design philosophy. CTG’s tour heads to one of them in Cedar Park where Lynne and Gary Wernli got their feet wet with pint-sized ponds and fountains in their gorgeous garden. Now, they have a full-sized pond where Lynne takes fabulous pictures of their diverse wildlife. And you simply must meet their darling pygmy goats and check out their rain chain pond! Many of us planted Afghan pines a few years ago. And many of us have lost them; two years ago I had to cut down one that we’d raised from a seedling. Daphne explains what happened to them, including Frank Simon’s tree that he and his family planted in 1996 as a living Christmas tree. Daphne’s pick of the week is Red Yucca (Hesperaloe parviflora). It’s actually not a yucca, but in the lily family. Whatever, it’s a great structural addition to the drought-tough garden. Hummingbirds adore the flowers. And you’ve got to respect a plant that can survive in a parking lot island! These days, you can get Hesperaloes in other colors, too. I love Bob Beyer’s picture of his three that include ‘Yellow’ and the latest Brakelights® Red Yucca (Hesperaloe parviflora ‘Perpa’ ). But watch out where/how you plant them! If Bermuda grass is in your zip code, do serious prep and stick with it when stragglers show up. Otherwise, you’ll end up with a horrifying picture like this, where Bermuda is strangling an innocent agave. In the vegetable garden, we head to Lake Austin Spa Resort, where Trisha shows how she stakes tomatoes and climbing plants. Climbers on her cattle panels also help shade some plants that need a little sunscreen!